Surat Diamond Bourse is the World’s Largest Single Complex spread over an area of 66 lakhs square feet and will have facilities like Independent custom office and International Banking facilities, Insurance Company, Safe Deposit Vaults, Diamond Testing Laboratories and Online Trading inside the Bourse. Idea for launching Diamond Bourse in Surat was conceptualized by Vallabhbhai Patel and other leading Diamantaires in the year 2014. The project work started by the end of 2015 and after land acquisition and all the necessary government clearance, the construction work started on October 25, 2017. Surat Diamond Bourse is the World’s Largest Single Complex spread over an area of 66 lakhs square feet and will have facilities like Independent custom office and International Banking facilities, Insurance Company, Safe Deposit Vaults, Diamond Testing Laboratories and Online Trading inside the Bourse. International Airport will start working in full swing by the year 2019. More than 4400 diamond merchants will have their offices in SDB. On its opening, at least 1.5 lakh people will get employment. Surat Diamond Bourse will be the most glorified place for the most precious gem on the earth and first of its kind in India. Belgium, Israel and Dubai are the main centres for raw diamonds in the world. Since 90 out of 100 diamonds are produced in Surat, this diamond bourse will be the biggest market of raw diamonds and polished diamonds in future. Diamond merchants will now be able to directly deal with International diamond merchants without having to travel abroad for their requirements of raw diamonds. Gujarat Diamond Industry has directly given an employment opportunity to more than 7 lakh people. SDB project was awarded to PSP Projects Ltd and the target given for completing the construction work is 30 to 36 months. By the end of Year 2020 construction will reach its completion stage and by year 2021, SDB will be fully functional. The office of Kiran Gems will be spread over 100,000 sq.ft space. 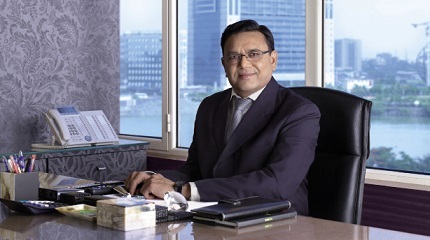 “We will be shifting our operations to Surat Diamond Bourse soon after our office is entirely furnished,” stated Vallabhbhai Patel, Chairman, Kiran Gems Pvt. Ltd.
Vallabhbhai Patel, Chairman, Kiran Gems Pvt. Ltd.